Project Scope: Creating a visual “logo” to communicate the annual conference theme. Develop 6-panel self-mailing registration brochure, 4-panel sponsorship brochure, 70 – page Program Book for conference attendees. 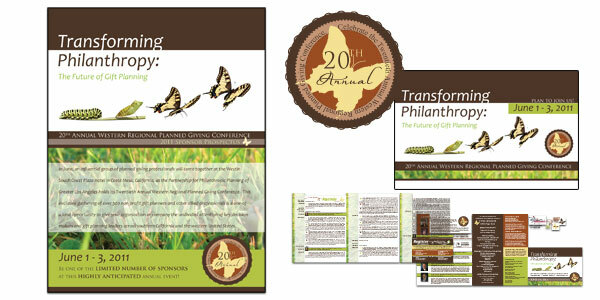 This year, we created a 20th Annual Conference seal to commemorate the 20th year of the Western Regional Planned Giving Conference. Various posters and banners are also produced.